MIDI and virtual instruments were one of the biggest game changers in music production and are the fundamental tools that a lot of producers use. Some producers rely solely on MIDI programming and samples or virtual instruments for their productions. The most beautiful part about it is that performances, nuances and notes can be shifted around after the initial recorded performance or can be programmed and never performed which opens up a whole new world for people who are not very savvy at playing a musical instrument. First Things First: What is MIDI? One of the basic mistakes people make when they think about MIDI is that they consider it audio – and it is not! MIDI is a digital protocol that enables software, hardware instruments and controllers that use this language to communicate with one another. The protocol allows for 16 channels of information to be communicated over one connection. MIDI carries information about events and transmits parameters such as pitch, velocity, length and all sorts of control signals such as tremolo, panning, audio volume, etc. The most common scenario where you will see MIDI in action is a MIDI keyboard controller connected to a Pro Tools system – and this is also the scenario we will look at in this tutorial. However, most devices that use MIDI also allow for connecting with USB and the most common configuration for keyboard controllers will be a combination of MIDI input/ output connectors and a USB connector. In order to record MIDI you will need a hardware keyboard MIDI controller or another device that uses MIDI protocol. I will assume you have a MIDI keyboard as that is the most common hardware device to record MIDI with. The first thing you have to think about is the startup sequence of you Pro Tools system. It is very important to power up you MIDI device before starting Pro Tools, otherwise the software will not detect the MIDI device. The right order for your start-up sequence should be: computer, any hard-drive that is not bus powered, any audio interface that is not bus powered, all your MIDI devices, your monitoring system and lastly, Pro Tools. All controllers should be plug and play and should play nicely with Pro Tools without any special setup within the software. Now, that we have our system up and running let’s make sure that our MIDI settings are right for recording. 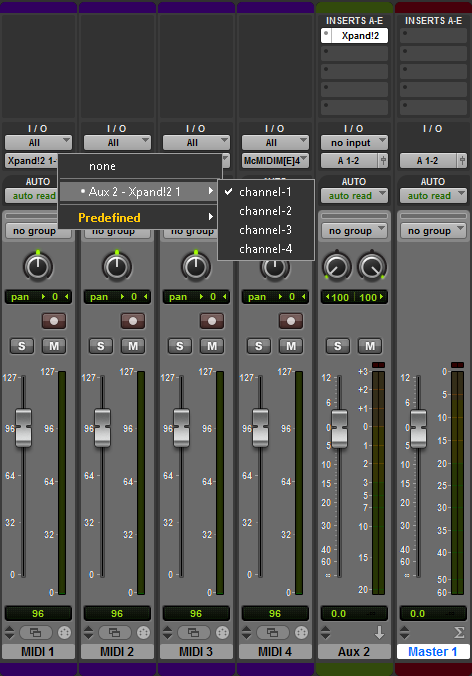 Create a new Pro Tools session and head over to the “Setup” tab and click on “Preferences“. In the new window that pops up click on “MIDI” and check that “first selected MIDI track” is selected in the Default Thru Instrument menu. Then, click ok and head over to the edit window. There are two types of tracks that can handle MIDI – instrument tracks and MIDI tracks. MIDI tracks store MIDI note and controller data only. Audio does not flow through a MIDI track and you need to connect the MIDI track to another track, an auxiliary one that has a virtual instrument instantiated on it. Instrument tracks on the other hand are a combination between a MIDI track and an auxiliary track and enable the user to instantiate a virtual instrument directly onto the track and the input to the track is MIDI while the output is audio. We will look at both scenarios. Now, if you select your MIDI track and play some notes on your keyboard you will hear the Mini Grand piano VI and you will see the audio signal pop up in the meter of the Auxiliary track and the Master Fader. Why Bother Using MIDI Tracks? Given that complex setup is required to use MIDI tracks why even bother using them when you have something as flexible as an instrument track in your toolbox? There are two scenarios in which you will find using MIDI tracks not only useful but the only solution. 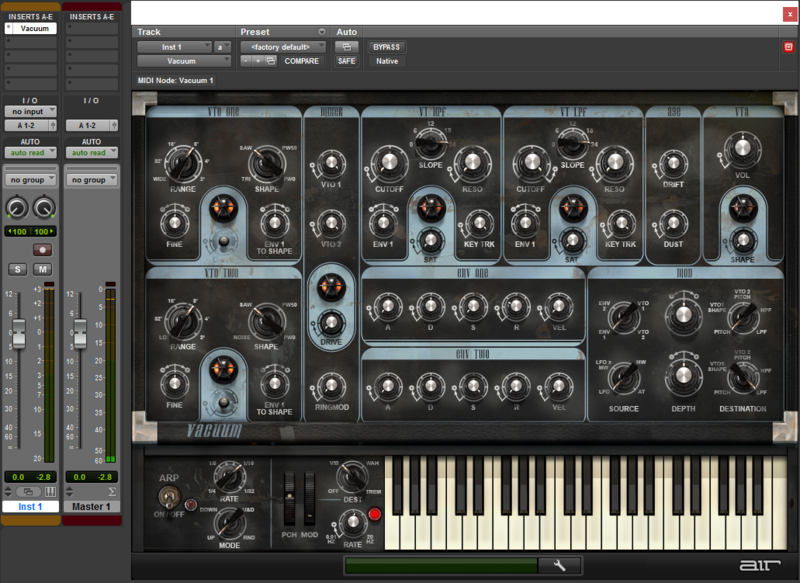 The first scenario is when you want to save some CPU and use the multiple voices on a virtual instrument. All that is left to do is fill up each of the four banks of tones in Xpand!2 with your desired tones and play. The second scenario is beyond the scope of the article but I will tell you a little about it. The beauty of MIDI is that you can alter a performance post factum so why not use this amazing flexibility with your favorite hardware synths that support MIDI? This can be done with Pro Tools and you can use your favorite synth’s as sound modules. The setup is similar to the MIDI track + Auxiliary Track scenario but the routing is a little more complex. 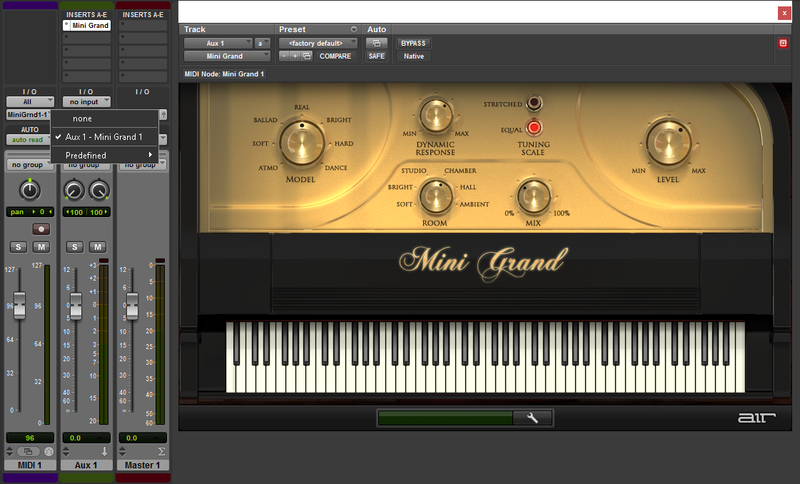 For our first recording we will use the simplest of scenarios: one instrument track with Mini Grand instantiated on it. Select the track and play a few notes to make sure there is signal passing through. Next, proceed to pressing the record arm button on the track, then the master record and finally hit play. You are now recording! When you are finished remember than you can audition it and name it if you want to keep it. Of course, after the recording you can edit the MIDI clip in any way you might imagine: stretch the notes, change the velocity, add new notes, delete original ones and the list could go on. As I stated in the beginning, MIDI is one of the building blocks of modern music production and it enables the bedroom producer to do things unimaginable a few decades ago. People who do not even play an instrument can now create complex arrangements that would require some amazing playing in order to perform. Mastering the use of MIDI is a must and even though slightly intimidating at first, it is a lot easier to understand and use than it might seem. Great article, I have a question. So using a MIDI controller to operate the Mini Grand or Vacuum is the only possible way? Is there a way to record just the MIDI controller(Like a keyboard) you are using enabling you to control what you are playing from the MIDI controller itself? Using a keyboard MIDI controller enables you to record MIDI information into Pro Tools. What do you mean by “record just the MIDI controller”? The article presents a detailed tutorial of recording MIDI from any MIDI controller or device. If you are asking whether there is a way to record audio out of your MIDI controller the answer is no, you cannot record audio out of a MIDI controller unless the device you are using is also a drum machine, synthesizer, sampler or piano.